Wedding days are stressful, especially for the bride and groom. It seems as if everyone has a question or needs a minute of your time while you're supposed to be relaxing and getting ready. 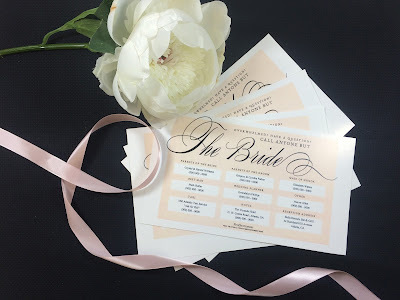 Create an insert to include with your wedding stationery so your guests, vendors and bridal party have all the important numbers to call instead of stressing out the bride. This simple printout could save you from a big headache and unnecessary anxiety the day of. Download the PDF and type in the information or fill it out by hand. Your guests will thank you for easing any confusion and you will be able to enjoy every special part of the day. Below is a sample of what the cards will look like without text on them. Each card is formatted for half a page so that printing is a breeze. Just print, personalize, and feel your stress melt away.